In the 21st Century one of the most fascinating new mediums being explored on a large-scale level is that of overhead imagery. Satellite imagery was once tucked away securely in the realms of the military and of the scientific community. With new applications such as Google’s Google Earth and Microsoft’s Windows Local Live, overhead imagery is becoming ever more prevalent in the civilian sector. In today’s terrorism-conscious world the obvious concern is one of national security, a concern which has proven to be unfounded. Open source imagery has become a common tool for many individuals. Overhead imagery has a myriad of uses in the private sector, ranging from business applications such as real estate to administrative applications such as land zoning. Overhead satellite imagery has been made available free to the general public at numerous locations on the internet, from Global Security’s Image of the Week to the National Geospatial-Intelligence Agency’s Raster Roam site. Perhaps the most significant development in the realm of open source imagery has been Google’s release of Google Earth, a free software application allowing users to browse a worldwide database of overhead imagery. Google Earth is the benchmark in today’s overhead imagery scene. The ease of use of the application allows users to view any point on the globe with ease. Points of interest can be placemarked, and placemark files can be shared with other users on the internet by inserting them into Google Earth’s placemark database. Google Earth has recently begun to see use in the mainstream media. FoxNews commonly uses Google Earth to depict the locations of news stories. Various corporations are beginning to see the value of the application as well. Frank Taylor’s Google Earth Blog constantly chronicles new industry uses of Google Earth, as well as significant updates to the imagery server or the software itself. The most common method of exploitation is to devise a series of placemarks for a given area and share them with potential clients or interested parties via a website. This particular usage is beginning to see widespread use in the field of real estate, allowing potential buyers to get a birds-eye view of the property in question and view the surrounding area. With Google Earth’s incorporation of placemark databases containing schools, restaurants, and other necessities, a fair assessment of a potential community can be made without ever leaving the home. While Google Earth is a valuable and powerful imagery exploitation tool, it is limited in select areas. Most significantly, the high-resolution imagery database is incomplete and as such constantly updated. While the entire globe is visible in at least 15 meter resolution, this is insufficient for detailed examination of most locations. The highest resolution available is 15 centimeters in select locations such as Las Vegas, with most other high-resolution areas falling around the 1 meter range. The problem is that there are many areas of potential interest that do not yet contain high-resolution imagery. Other high-resolution areas are sometimes updated with more current imagery, potentially causing various placemarks to become invalid. In order to obtain open-source imagery of the desired resolution, a user may choose to obtain such imagery from a paid source such as Digital Globe. This method ensures that the user will end up with the desired imagery at the desired resolution. The only limitations are the price, and the time it can take to collect the imagery if it does not already exist in a database. On the 13th of January, 2007, The Telegraph reported that insurgents operating in Basra in southern Iraq appeared to have been using Google Earth to pinpoint British troop locations to conduct terrorist attacks. This incident appeared to represent a potential problem with public access to overhead imagery. The reality is far from serious. In order for the extremists to have made use of Google Earth imagery effectively, it must have been current. The imagery of downtown Basra currently available in Google Earth was taken in 2002. Imagery dates can be verified by viewing the Digital Globe coverage areas within Google Earth and clicking on the placemarks denoting the collection date. At first glance, there would appear to have been imagery of Basra taken as late as 2006. However, closer examination shows that this imagery was not incorporated into the Google database, as the snapshot view depicts extreme cloud cover over the area. Google Earth does source a good deal of imagery from Digital Globe, but every image taken is not necessarily incorporated into the database. 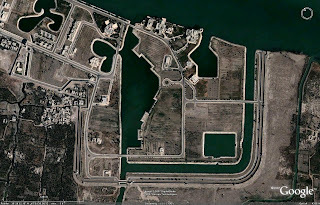 Ergo, any current imagery in Google Earth would not have assisted extremists in Basra in locating British forces. The following image taken from Google Earth depicts the current view of the Basra Palace. No British troops would appear to be in residence. The Telegraph asserts that extremists had printouts of Google Earth imagery depicting British forces in Basrah Palace. While the imagery in the database does not depict any occupation at the palace, there are two other points to be considered. First, external imagery from sources such as Digital Globe, Global Security, or Terra Server can be incorporated as an overlay into Google Earth. Just because the imagery was taken from Google Earth, it therefore did not necessarily source from Google Earth. Secondly, The Telegraph has alleged that Google Earth has “blotted out” certain areas where sensitive British military operations are conducted. These areas include Hereford, home to the British Special Air Services commandos, and Faslane, home to the UK’s Trident submarine strategic nuclear deterrent force. Unfortunately, The Telegraph’s explanation does not wash. Simply put, Hereford and Faslane were never in anything other than 10-15 meter resolution to begin with. After reading many of Patrick Robinson’s novels, the author became enamored with Faslane and was on the lookout for a high-resolution update to contain the submarine base. That update has, to date, still not happened. It is possible that Google “rolled back” their coverage in Basra to an earlier date to remove evidence of British occupation of the city. The surrounding area includes Basra International Airport. There are various placemarks visible for British combat aircraft which are no longer visible, suggesting that an imagery change did in fact take place. The following image taken from Google Earth depicts a parking ramp at Basra International Airport. The placemark for an RAF C-130 Hercules aircraft can be seen, clearly showing that the imagery has been changed at some point. The Basra incident highlights one of the chief concerns of public access to high-resolution overhead imagery: such imagery may enable terrorist or military forces to gain an advantage over an enemy. There are a myriad of military installations and targets which are visible in overhead imagery, particularly in Google Earth. The question therefore becomes whether the ability to access such imagery is a serious threat to the national security of a nation being imaged. There are two different aggressors which should be considered: terrorists and nation-states. Terrorists and other insurgent groups would seem to have the most to benefit from having access to overhead imagery. Nation-states would not, for the most part, need to rely on open-source imagery for intelligence, as they would enjoy access to a multitude of other intelligence sources. In order for a terrorist to make use of overhead imagery, the imagery must be current, it must depict the target in sufficient resolution to be of value to a potential operation, and it must be available. Overhead imagery from a plethora of sources fits these requirements, particularly availability; there is nothing stopping a terrorist from accessing Google Earth or ordering imagery from Digital Globe. However, the question is whether or not that imagery provides the extremist group with a particular advantage or ability that they would not have otherwise enjoyed. The answer is a resounding no. Extremists employ various methods of attack, including car bombings, improvised explosive devices, and hit-and-run tactics. None of these tactics would gain any significant advantage if overhead imagery was available. However, mortar and rocket attacks would seem to benefit. Possessing overhead imagery would allow for more accurate targeting as target locations could be more accurately measured. The problem with this argument is that rocket and mortar systems are unguided and inherently inaccurate to begin with. Were guided weapons employed, the added accuracy could in theory be of a tactical benefit. With an unguided weapon, however, the added knowledge gained from analyzing overhead imagery is not as useful. The idea of terrorists being able to gain more detailed knowledge of target areas is also in question. Many Coalition bases in Iraq, for example, possess native Iraqi workforces. Intelligence on troop and facility locations can be gleaned from these individuals by extremist groups. Also, any street map will provide a good deal of information regarding the potential locations of facilities. With careful observation and a good street map, an insurgent in Basra could accurately map out troop and facility locations. Ergo, overhead imagery is not necessarily needed. While it would seemingly negate the need for a period of observation, it does not provide an insurgent group with anything they cannot obtain for themselves. A nation-state presents a whole new argument. While the insurgent group may concern itself with simple targets such as troop concentrations or bases, the nation-state may desire to be far more detailed in its targeting. Examples of potential targets include surface to air missile (SAM) sites, nuclear weapon facilities, and naval bases. The key to gaining intelligence of any value from open source overhead imagery lies in the detail of the imagery itself. Consider the following scenario: a Turkish combat aircraft is tasked with striking a naval vessel leaving Sevastopol which is going to deliver military equipment to Greek Cypriot forces on Cyprus. The primary static threat to a strike aircraft comes from early warning systems and SAM sites. Once again, imagery in Google Earth can be considered a likely source of open source imagery for the area as Sevastopol is imaged in high-resolution. The problem becomes one of system identification. Defending Sevastopol, there are three active SAM sites that can be identified. Due to the nature of the imagery, they can be identified as Russian-made Almaz S-300P family systems. This is where the problem lies. Further east near Alushta, there is an S-300PT which can be identified. The S-300PT is an early-model S-300P system with a range of 47 kilometers. The problem lies with the other three sites: they cannot be positively identified as anything other than generic S-300Ps due to the similarities between the remaining variants. The S-300P family contains missiles ranging from 47 to 200 kilometers; while the systems can be broadly classified as S-300PM or S-300PM-1 variants due to the length of the TELs, this does not provide insight into what missiles are being employed. Knowing which system an aircraft will face is an integral part of the mission planning process; it will dictate the route to be taken, the sortie profile, and in most cases the weapon to be employed. If shorter-range systems were present, then perhaps a standoff weapon would be used in the attack. This scenario highlights the value of a military-grade imagery intelligence capability, as well as the value of other intelligence sources such as Electronic Intelligence (ELINT) in conducting a study of a potential target area. Commercial overhead imagery is therefore not particularly valuable to a nation state as a source of intelligence. There is another reason why open source imagery is not typically valuable to a nation-state. Overhead imagery typically contains a snapshot of a particular moment in time. There are numerous SAM sites, for example, visible worldwide using Google Earth. Many of these sites were unoccupied at the time they were imaged. However, many modern SAM systems such as the S-300P are mobile systems and can easily be relocated. Relying on a commercial image obtained at some point in the past does not therefore necessarily provide a current view of an enemy’s defensive network. Most military intelligence gathering organizations will have the capability to gather near real-time imagery of a potential target area, providing a much more current picture of an enemy’s forces in the area. A further example would be that of naval facilities. While a snapshot of Litsa Guba may show four Typhoon-class SSBNs in residence, there is no guarantee that the submarines are actually in-residence given the timing of the image acquisition. There is one more potential national security concern with open source imagery. While open source imagery has been shown to not present an aggressor with an advantage other than convenience, this concern is far more serious. Many areas inside the United States and the rest of the world are becoming visible to the general public for the first time. There is the chance that sensitive or classified activities may be uncovered. At first glance, this would seem to be mildly ludicrous. Take the example of Area 51 in the United States. Area 51 has long since been mooted as the home of classified aerospace-related test activity. 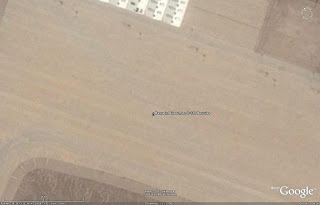 Area 51 is also visible in Google Earth in high resolution. While there are F-16s and 737s visible on the tarmac, no “black jets” are anywhere to be seen. The reason, provided the aircraft were present to begin with, is that satellite orbits can be tracked. During the Cold War it was common practice for test aircraft to be concealed from view when Soviet satellites were known to be overhead. This practice does not mean, however, that evidence of sensitive or classified activity cannot be discerned using open-source imagery. The preceding image captured in Google Earth depicts a fenced in facility outside of El Paso, Texas, set half a mile off of Route 180. At first glance, this appears to be a benign military facility. Closer examination, however, reveals something far more sensitive. Visible inside the facility are a plethora of foreign weapon systems, including Russian-made SA-6 and SA-11 SAM systems. America’s possession of foreign weapon systems is nothing new or sensitive. The acquisition of Moldovan MiG-29s in the 1990s was well publicized, for example. This facility would appear to be something of an enigma, however, as there is no reference in any open source publication to American acquisition of an SA-11 SAM system. The logical assumption is that this facility is related to the exploitation of foreign weapon systems. Given that the US Army’s Air Defense School is located in nearby El Paso at Fort Bliss, this would seem to be a sensible location for SAM system exploitation given the large range areas that Fort Bliss contains. This activity in itself is not necessarily sensitive, but the mention of an SA-11 in the United States could be enough to cause a foreign power to investigate how exactly it was obtained, potentially leading to a future problem should it turn out to have been covertly acquired. That being said, once again image resolution comes into play here. 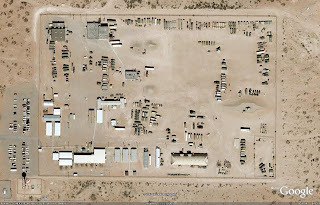 Without closer examination, either on-site or through very high resolution imagery, the systems in the El Paso facility cannot be positively identified as actual hardware; they could merely be decoys used for training purposes or as range targets. This does not alleviate the concern that national security could be threatened by a knowledgeable interpreter armed with the right set of imagery to work from. The news media can also be a source of concern. In 2001, the United States was gearing up to begin Operation ENDURING FREEDOM. The author was stationed at Al Udeid air base in Qatar in March of 2002 to support this effort. The location was classified until a March 2003 visit by the Vice President led to the announcement of the location by the news media. Prior to this, however, the news media reported in January 2002 that Global Security had obtained satellite imagery of the airbase from Digital Globe. This was a clear breach of security, and could have led to disastrous results. A Middle Eastern insurgent group, or even a nation state like Iraq, could have chosen to strike the airbase, whereas they may not have been aware of the facility had the news media not plastered satellite imagery of Al Udeid all over their networks. Open source imagery does not appear to present a serious risk to any nation’s security. However, if open source imagery is regarded as a threat to national security, the government being imaged does have a number of options to alleviate its concerns. First, the government can take steps to ensure that sensitive activities are concealed from satellite view by studying satellite over flight patterns. As mentioned before, this was a technique employed by the United States during the Cold War. Secondly, the government can request that imagery providers such as Digital Globe or Google Earth do not release imagery or reduce the image quality of sensitive areas such as military installations or nuclear facilities. In Google Earth, for example, the NATO AWACS base at Geilenkirchen, Germany is pixellated, precluding any viewing of the airbase or its contents. This sort of request may have led to the rolling back of imagery near Basra in Google Earth, as was previously discussed. Thirdly, nation states could enact laws restricting the publication of imagery depicting military facilities or military operations without prior approval. While this would likely meet with public disapproval, if the nation state does perceive such imagery to be a national security concern, then this would appear to be a logical course of action. Open source overhead imagery is a fascinating tool for professionals and enthusiasts alike. While there are certain national security concerns over the public availability of overhead imagery, the concern is for the most part unfounded. Restricting access to overhead imagery will not deter either terrorist groups or nation states from using violence to achieve their goals, nor will it prevent them from using other means to gather vital intelligence information. Given the characteristics of the imagery and the overall global situations into which it is injected by the media, the only possible conclusion is that the public availability of open source overhead imagery is not a serious national security concern, nor does it provide terrorist groups with a significant advantage in terms of planning and carrying out attacks. In all actuality, the presence of publicly available imagery might be a deterrent in some cases. Either way, overhead imagery is here to stay, and as a whole the world is better off for it thanks to the numerous civilian, scientific, and commercial uses it provides. Available online at http://www.globalsecurity.org/eye/index.html; recent updates appear to be on a less than weekly basis, unfortunately. James C. O’Halloran, ed., Jane’s Land Based Air Defense, 15th edition (Surrey: Jane’s Information Group Limited, 2002), 148-150. With the current developments in super agility, and the ruthless performance of today’s WVR air-to-air missiles such as the Israeli Python 4, it is no surprise that most fighters have adopted BVR weapons as their primary air-to-air armament. The last true Western Big Stick in the air-to-air arena was the US Navy’s AIM-54 Phoenix, with its 100+ NM range and active radar seeker. The LRAAM project of the Mid-1980’s, charged with producing a successor to the AIM-54, would have given the US Navy an even greater capability well into the 21st Century. However, the project was terminated, leaving the medium-range missile as the primary air-to-air weapon in the BVR arena in the West, until the European Meteor and the American AIM-120D are introduced. The primary purpose of the AIM-54 was to defend carrier battle groups at long range from attack by Soviet bombers and their cruise missiles. This reason, coupled with the fact that the AIM-7 (and later the AIM-120) was regarded as more than capable of countering the Soviet fighter threat, explains why the USAF never took it upon itself to develop its own long-range weapon or adopt the AIM-54 for its own use (although the F-14/AIM-54 combination was briefly considered, as well as an AIM-54 armed F-15). Russia’s premier long-range AAM, the R-33, was designed with a similar purpose in mind. The MiG-31/R-33 combination was designed to counter the threat of Western air-launched cruise missiles, specifically the AGM-86B, and their launchers. Now, however, Russian weapon designers are exploring new tasks and capabilities for the next generation of LRAAMs. LRAAMs are limited in their usefulness. A large weapon such as the AIM-54 or R-33 would have a difficult time against a modern, agile fighter such as the Su-27 or F-16. To understand this, one needs only to examine the flight profile of the AIM-54. The Phoenix achieves its extremely long range by using a substantial boost motor, propelling it to heights in excess of 100,000 feet and speeds greater than Mach 6. The missile then nosedives towards its target, activates its seeker when within range, and makes the intercept. But what happens when one of these weapons is employed against a maneuvering target? A long-range missile expends most of its kinetic energy during the boost phase of its flight, leaving it very little with which to maneuver against an agile target. This is part of the reason behind the failure of the AIM-54 to score an air-to-air kill in DESERT STORM: the AIM-54 was never designed to be employed in such a manner. One solution would be to fire the weapon at a shorter range, but then you are better off using a dedicated MRAAM such as the AIM-120; large, heavy weapons in the AIM-54 class are typically not as maneuverable as smaller, lighter MRAAMs. LRAAMs are more adept at engaging non-maneuverable targets, such as lumbering bombers, and cruise missiles, which for the most part fly straight courses, making course corrections as dictated by their guidance systems. Granted, ramjet propulsion and gel-fueled rocket engines can now give MRAAMs ranges touching 60 or even 100 nautical miles, pushing them into the LRAAM class. This is where the capabilities of Russia’s new LRAAMs become even more impressive. The first new LRAAM to emerge from behind the former Iron Curtain is the Vympel design bureau R-37. This successor to the R-33 features a dual mode 9B-1388 active/semi-active seeker head and can reach ranges touching 160 NM, demonstrated in an October 1993 test launch from a MiG-31M, the weapons intended launcher aircraft. This was such an accomplishment, especially in the former Soviet Union, that in April of 1994 Boris Yeltsin sent telegrams to the OKBs (design bureaus) involved congratulating them on this achievement. The weapon is matched to the improved Zaslon-M radar of the MiG-31M, which can accommodate six of these advanced weapons under its fuselage, replacing the baseline MiG-31’s four R-33s. The R-37 retains the basic aerodynamic arrangement of the older R-33, with a few notable differences. The control surfaces have been reshaped, to provide the weapon with better agility, and the rear control fins have been moved further aft, leaving a noticeable gap between these fins and the missile’s wings. The R-37’s nose has also been reshaped, no doubt due to the new seeker head. Semi-conformal carriage is still achieved by folding the rear fins, as in the R-33. Still touted as primarily an anti-cruise missile weapon, the R-37 is slated to be incorporated into the upgraded MiG-31BM at a future date, possibly in the form of the further improved K-37M variant (Note: In-service Russian AAM designations begin with R, test weapons or weapons still in the prototype stage have designations beginning with K.). Baseline R-37s may also arm improved MiG-29SMTs in the Russian Air Force, although this is unlikely as even an upgraded FULCRUM lacks the radar needed to fully take advantage of the R-37’s impressive intercept range. On the surface the R-37 appears to offer only technical improvements over the R-33. The advantages it will bestow upon the MiG-31, however, are more than just longer reach. A longer ranged AAM will give the MiG-31 the capability to engage targets at greater ranges, giving it more time to reacquire and reengage targets which have gotten past the first wave of weapons. In theory this will increase the effectiveness of the MiG-31, meaning fewer aircraft will be needed to fulfill the same role. Given the current financial state of the Russian military, this will obviously be very beneficial. The second LRAAM to emerge from Russian armament designers is the little known Novator KS-172, also referred to as the AAM-L. This weapon has been seen in armament displays accompanying Su-35 aircraft and has recently been displayed as the improved KS-172S-1 under the wing of an improved Su-35BM FLANKER variant. The AAM-L has an entirely different purpose than the R-37. Novator has designed a very long-range weapon intended to specifically attack AWACS aircraft equipping hostile nations. Where the R-37 retains a complex arrangement of control surfaces, the AAM-L is almost barren. The weapon resembles a typical surface-to-air missile, such as the 48N6 (S-300PMU-1/2), possessing only small control fins at the rear of a long, pointed body. The active radar homing missile is reported to have a range touching 216 nautical miles, which can be extended with the addition of a booster stage. Long range is a must for a weapon intended to target aircraft such as the E-3; this keeps the launching aircraft out of range of the weapons employed by escorting fighter aircraft. It is no hidden fact that much of the success of Western militaries comes from the battlefield information superiority bestowed upon them by modern airborne sensor platforms. AWACS aircraft such as the IAI Phalcon and E-3 Sentry give commanders an unrivalled picture of the airborne arena and provide pilots with unparalleled situational awareness. The J-STARS platform provides commanders with a comprehensive view of the battlefield, allowing them to redirect and reposition forces to counter and defeat an opposing army. Winning a war against a Western military force armed with this knowledge proves a daunting task, as demonstrated by the rout of the Iraqi military in 1991. To put it another way, the 21st Century war is a digital encounter, and successfully engaging an enemy armed with these information resources would prove difficult to even the most well-equipped military. The AAM-L is intended to deny an enemy access to this wealth of knowledge, hopefully giving the Russian military the edge needed to prevail in a conflict. Military weapon development progresses as follows: a threat is identified, a counter is developed, and the counter is deployed. In the case of Russia’s LRAAMs, the threat was identified as cruise missiles and AWACS aircraft. The counters developed were the R-37 and AAM-L LRAAMs. Although they have yet to be fielded by the Russian Air Force, the existence of weapons in this class is enough to cause Western designers to consider new approaches to aircraft and missile design, most notably in the form of stealth technology. Quite a few of the designs for US Navy and Royal Navy future carrier based AWACS platforms have already been seen to incorporate stealth technology. Of course, one can assume that this will only cause the Russians to develop further advanced weapons and countertactics; and the circle continues. One thing is for certain: the technology exists to deny an enemy the ability to use advanced sensor platforms and rely on cruise missile attacks. Perhaps in a future conflict the ability to overcome these losses will be how military capabilities are analyzed.